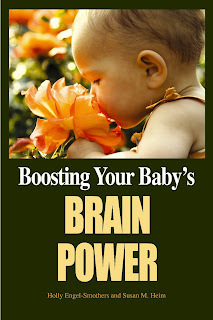 I recently had the opportunity through Mom Fuse to read over a brand new book titled "Boost Your Baby's Brain Power". This book covers multiple topics concerning your brand new baby. While I originally thought this may be one of those books that tries to tell you your kid can be college ready by the time they're 5, I was pleasantly surprised by the amount of information in it based on real facts. This book moves throughout your baby's first year of life showing you what they are learning at each stage and how the mind is actually making different connections that will help set your child up for easier and better learning. I found the chapters on vision and hearing especially informative, but my favorite chapter was the one on temperament. Maybe it's the fact that I have another babe on the way, but it's so neat to hear how babies can be so different even inside the womb and at birth! All in all, this is a well written, informative book for parents and caregivers! And while our children will always reach their developmental milestones at different times, reading a book like this can help you realize how to maximize your kids own potential.